Bryan Lunduke began his computing life on a friend's Commodore 64, then moved on to a Franklin Ace... and then a 286 running MS-DOS. This was followed by an almost random-seeming string of operating systems: ranging from AmigaOS to OS/2, and even including MacOS 8. Eventually, Bryan tried Linux. And there he stayed. In 2006, Bryan founded the Linux Action Show - growing it into the largest Linux-centric podcast on the planet. He's also the creator of 'Linux Tycoon,' the video game about managing a Linux distribution. Today, he is a writer and works as the Social Media Marketing Manager of SUSE. On this here blog, he seeks to accomplish two goals: 1) To be the voice of reason and practicality in the Linux and Open Source world. 2) To highlight the coolest things happening throughout the world of Linux. You might not know it, but inside your Intel system, you have an operating system running in addition to your main OS that is raising eyebrows and concerns. It's called MINNIX. If you work within a Linux terminal, working with non-Linux users can be difficult. These tools help with document compatibility and companywide instant messaging. An interview with Robert Taylor, former manager of Xerox PARC, shows TCP/IP designs were based a lot on the PARC Universal Packet (PUP) networking protocol suite. A server going down can really muck things up for any business. Also problematic, and costly, though, are slow servers, databases and networks. Companies store lots of customer data – including personally identifiable information – raising concerns about the cost to store that data, as well as the need to secure it. When disaster strikes and internet access is knocked out, how can you communicate? Ham radios and IP over Avian Carriers are two options. The current way open computing standards are decided is broken. Deciding what to replace it with, though, is difficult. There’s no one easy solution. The new version of Nextcloud includes end-to-end encryption and enterprise key management. The World Wide Web Consortium’s decision to keep votes about DRM secret and that it censured the EFF for “disclosing even vague sense of a vote” raises concerns. Cloud storage is the fast-food way of storing data, and it will give you the IT equivalent of gastronomical distress. You’ll wish you took time to set up your own server. 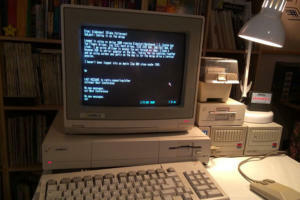 Before we had always-available, fast connections to multiple servers, we had dial-up modems and bulletin board systems (BBS). And it wasn’t even that long ago.